Tuoyo Egodo: Two tries for Castleford Tigers against Newcastle Thunder. Castleford Tigers ran out comfortable winners of their final pre-season warm-up as they beat Newcastle Thunder 42-6 at Kingston Park. A number of senior first team players took the chance to impress on their last opportunity to catch the eye of head coach Daryl Powell ahead of the big kick-off next Friday with the scoring shared around as the Tigers ran in nine tries. 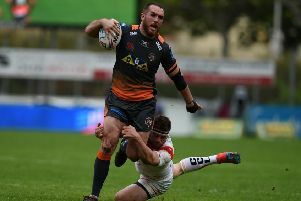 Strong winds made it hard work, but as in their game a week earlier against Leeds a fast start put Cas in control after they led from the second minute. Their first set brought the first try as Tuoyo Egodo got to a high kick by Jamie Ellis and knocked the ball back for James Clare who then sent the supporting Alex Foster over. Matt Cook crashed over for a second try soon after and good defence kept out Mo Agoro as he was forced into touch at the other end. It was 14-0 after Egodo finished a move he had start in his own half when combining with half-back Cory Aston to score. Aston had trouble converting in the difficult conditions, but was able to add one goal to the early tries. The other starting Cas half-back, Ellis, was next to score as he opened up the home defence with a clever dummy and raced over for a try converted by Aston. Newcastle showed what they could do in attack and earned a drop-out with Tom Shaw’s kick, but the pressure came to nothing. Cas were back on the attack with winger Clare making a fine break to give them good field position. The other winger, Garry Lo, then raced in for his first try in Castleford colours to make it 24-0 at half-time. The Tigers continued their good work in the second half, scoring again straight away as Ellis put a searching grubber kick through and centre Egodo got to the ball first for his second touch down of the day. England man Mike McMeeken created another score with a pass that sent Greg Minikin over in his first game after a shoulder operation. Newcastle were torn apart once more soon after when young forward Brandon Douglas broke through tackles on a strong run. Ellis then came up with a long pass to send Jy Hitchcox over out wide. To big cheers from the home fans Newcastle put some points on the board as prop forward Liam McAvoy powered over and Shaw added the conversion. But Cas had the final say as young outside back Calum Turner showed good feet to get past several would-be tacklers for a well taken try and Aston’s third conversion completed the scoring. Scorers - Newcastle: Try McAvoy; goal Shaw. Castleford: Tries Foster, Cook, Egodo 2, Ellis, Lo, Minikin, Hitchcox, Turner; goals Aston 3. Newcastle Thunder: Ritson; Agoro, Brown, Calland, Sidney; Young, Shaw; McAvoy, Simons, Aldous, Ollett, Luckley, Fitzsimmons. Subs: Pointer, Capper, Blair, Craig, Turland, Rennie, Aldous, Lloyd. Castleford Tigers: Hitchcox; Clare, Egodo, Storey, Minikin; Ellis, Aston; Cook, O’Neill, Maher, Foster, McMeeken, Clark. Subs: Lo, Douglas, Ray, Turner, Sweeting, Peachey.